I was going to dazzle you all with a post about the exiting realm of Digital Asset Management (Oooh! Ahhh! ), but I thought I would stick with the encoding kick I’ve been on recently. Encoding solutions are much like interns: you have no idea what they are fully capable of, you have no idea how well they can multi-task, and there sure as hell there are a lot of ‘em. Thus, we need to develop some baselines with which to judge perspective candidates. There are several yardsticks with which to measure these by. But which ones? Features? Speed? Cost? Hardware with Software Encoders (complete bundled solutions). Most software solutions – that is, no dedicated video hardware appliance or card – will run under $10,000. They range from free to several thousand dollars. Sorenson Squeeze and Apple Compressor, for example, come free with Avid Media Composer and Final Cut Studio, respectively. They typically lack in advanced features, such as: robust format in/out support (codecs and wrappers), as well as concurrent & efficient encoding. Hey, ya get what you pay for. This is where I present you, Teeming Millions, with good news and bad news. Good News: You can (most likely) use your existing computer to run the software! 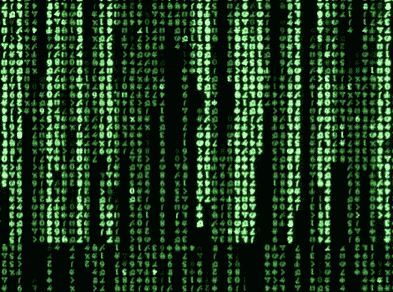 Thus, buying a new CPU – and the best one possible – will slash those encode & transcode times. However, an industry standard Mac Pro or HP Z800 will cost several thousand dollars. Lastly, this solution obviously leaves you high and dry when it comes to capturing from or laying back to tape. Short of a splattering of solutions which handle firewire based solutions, those aging analog decks will have to remain very large paperweights. The next level is Hardware Encoders. It’s long been known that hardware encoders give better looking encodes. It’s also known that they are usually faster than their software counterparts, due to the main fact they’ve been built for one purpose, and one purpose only: to crank through that file, smile, and ask for more. Purchase a hardware card for your computer (Digital Rapids, Inlet, Content Agent, to name a few). This allows you to utilize the power of the card for encoding. Purchase a standalone hardware appliance (Telestream’s Pipeline family, for example). No matter which method you choose, you will still need a CPU as the host. One benefit of choosing a hardware solution is that the software that accompanies the hardware is a bit more robust than the standalone software solutions. A little somethin’ for the effort, if you will. This can include increased advanced format support, concurrent and/or distributed encoding, logic based encodes, and higher levels of automation. A majority of the cards and appliances also have the added benefit of audio and/or video spigots on board to interact with video decks. If anything in your workflow requires the use of a deck, then a hardware based encoding solution is your only viable option. In some cases, these solutions can handle some of the work your expensive edit bay does, such as batch capturing from an EDL (or ALE). I’d be remiss if I didn’t mention Hardware Accelerator solutions – that is, computer cards that have no I/O, but serve as a way to encode faster by offloading the encoding process from the CPU to the internal computer hardware accelerator card. These, too, usually cost several thousand dollars and often only accelerate the encode of a small number of codecs. Beneficial for some specific workflows, but not very flexible when multi format deliverables are needed. Lastly, we have the highest echelon: Hardware with Software Encoders. In most cases, it’s a qualified, bulletproof solution that has a tricked out CPU, video I/O card, a dedicated hardware encoder, and possibly storage, tuned perfectly by the manufacturer to be as efficient as humanly (err, mechanically) possible. You get the whole machine from the manufacturer. The system typically leverages a combination of hardware encoding and software encoding to produce the best quality image in the shortest amount of time. These solutions also tend to be ala carte – you pay for a feature or codec you may need. The base software is powerful, but specialty codecs and or abilities are a pleasant add-on to the bottom line. Omitting these is great when you need to save money, but a headache at 3am when you suddenly need that feature. These integrated solutions offer the highest level of automation, quality, and flexibility – but usually run over $25,000. Is the client capturing baseband video? Is the client simply transcoding existing files (or, using NLE generated files)? Does the client have a large volume of media to encode in a short period of time? Is the client outputting baseband video? Is the client simply creating digital deliverables? Is the resulting encoded media going to a broadcast facility, NLE, web, or film out? These questions determine if the client needs video I/O ($10,000+), and if the client needs a more expandable (read: expensive) solution which can handle professional deliverables. This, of course, dictates what solution you can provide in the pricerange – and when to break it to the client that they need to re-think the situation. Encoding from a baseband source – using a professional, non kluge Rube Goldberg solution, will cost close to – if not more – than $10,000 – without the CPU. 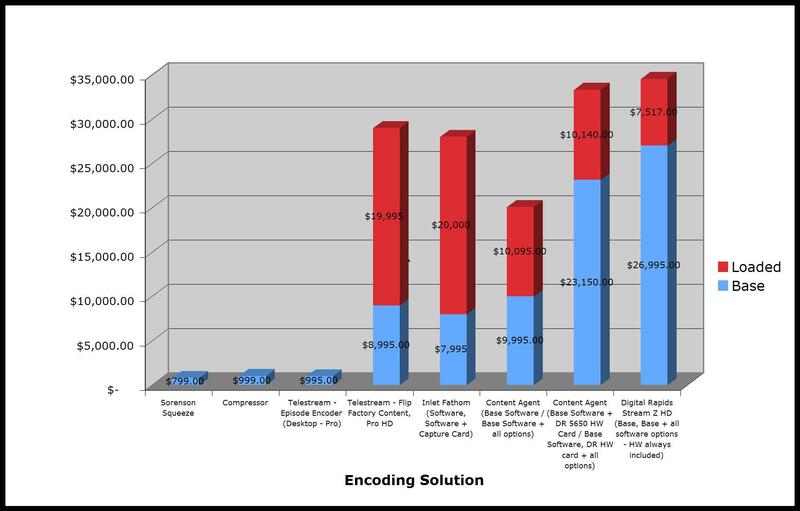 Most encoding solutions still require the purchase of at least 1 CPU. This is obviously not true at the highest echelon – but for most solutions – the user will need a powerful CPU. Professional formats, (broadcast and sometimes Flash) require the purchase (licensing) of a 3rd party codec – usually from the encoding manufacturer. See: ala carte. This is why knowing the desired input and output format of the files is paramount. And lastly, this is the most common question I am asked – and the one I still have the most problems answering: How long will the encode take? Encode times vary wildly, and depend on CPU, hardware, source format, output format, encoding settings, storage, and length of clips – to name just a few variables. It is nearly impossible to give a concrete answer. It’s akin to choosing a camera: you need to test it, and see for yourself. Your workflow will be different than everyone else’s. I’ve assembled a comparison of popular encoding solutions, based on cost (MSRP). I’ve included base configurations, as well as “loaded” configurations – with all of the bells and whistles.